Our team at Hennes Orthodontics realizes how a smile helps introduce people to each other. We would like to introduce our smile to yours and make it our best. Dr. Jerrold Hennes and his team of friendly, knowledgeable professionals have been creating beautiful smiles for more than three decades with great success. Our practice would like to share with you what the team experience of Hennes Orthodontics is all about, and how our clean office has the latest dental technology, including digital X-rays. We also work to make your visit run smoothly by having a computer check-in as well as text and email appointment reminders. We want to help you obtain your best smile, and we have created an orthodontic environment that is geared to achieve this result. "We are using Dr.Hennes for the 3rd time. First with my daughter, then my son, then myself. Every time we had a wonderful experience and refer people to him every chance I get." "All steps of the braces have been smooth sailing. Setting up appts, having to change appts, directions from staff and the orthodontist have been wonderful and great experience." "Very efficient and provides wonderful service." "We love Dr. Hennes and his staff. My son has been going for a couple of years and we're really pleased with the results and ongoing care. Office is super fun with video games and movies." "The entire office is friendly and personable. We have been coming here for years and they always ask about activities the kids are doing. It's a nice place to go." 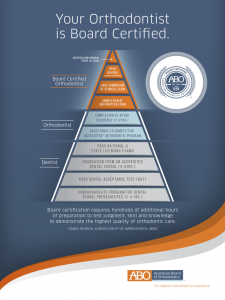 We know you have a choice when it comes to choosing an orthodontist. We enjoy being here for you, and are committed to giving you a wonderful experience when providing our orthodontic care in Vista and Poway, California, as well as the surrounding communities of Oceanside, Carlsbad, San Marcos, Rancho Peñasquitos, Scripps Ranch, and Carmel Mountain Ranch, California. We have two fun offices with superhero and movie memorabilia themes so kids (and their parents) can have fun while receiving the treatments that improve oral health. Please call or e-mail us today to visit us for a comprehensive complimentary orthodontic consultation. You will be happy you did.